Outdoor living has come a long way since the days of foldout lawn chairs and handheld fans. Today’s outdoor entertaining areas range from poolside patios to outdoor kitchens, and each style has its own allure. But there are some outdoor living accessories that accentuate any space. 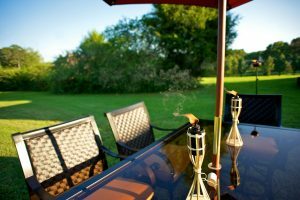 Prepare your backyard for summer with these outdoor living essentials. Furniture. Outdoor furniture sure has come a long way. Instead of soft plastic lawn chairs that leave everyone’s legs striped red, modern outdoor furniture has all the elegance and comfort of indoor furniture. Accent your outdoor spaces with chairs, tables, and couches for maximum comfort. Landscaping. Bursts of bright flowers may paint a pretty picture, but landscaping can be functional as well as beautiful. Plant insect-repelling perennials for an outdoor entertaining area that’s as cozy as it is attractive. Decor. Give your outdoor spaces some personality. At Ace of Gray, we carry a wide range of outdoor decor to transform your lawn and patio. Accessorize your outdoor spaces with an attractive new bird bath, garden ornaments, weather-resistant throw-pillows, or collegiate gear to show off your team spirit. Grills and grub. No outdoor entertaining area would be complete without an electric grill, charcoal grill, or wood smoker. Delight your guests’ taste buds with succulent meats slow-cooked while you relax outside. We have a full range of grills and grilling accessories, as well as savory sauces and rubs to take your grilling to the next level. Transform the way you see outdoor living. Visit Ace of Gray for grills, gear, and outdoor decor.